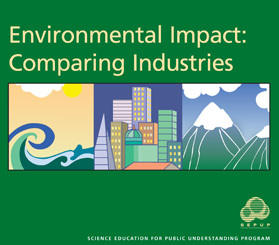 Environmental Impact: Comparing Industries is a SEPUP module designed for use in grades 6–12. The module contains a series of 8 activities that provide approximately 3–4 weeks of instruction. This module focuses on chemical formulas, chemical reactions, and properties of chemicals. Having an industry in your community can lead to positive and negative outcomes. In this module, students investigate these through a scenario in which they imagine they are residents of an island who will vote to allow a factory to be built. Students engage in hands-on explorations of two industries—mining and chemical manufacturing—and read about gasoline production. These explorations provide the students with an understanding that all industries have common needs: obtaining raw materials, manufacturing a product and safely disposing of wastes. Students are assessed on their ability to use evidence and identify trade-offs.